Since 2014, all American citizens and legal immigrants have been required to carry health insurance or face a tax penalty. There is now a penalty, known as the “individual mandate,” that has to be paid by everyone who does not health insurance. The penalty can be calculated in one of two ways; you are required to pay the higher of the two amounts. Method one involves calculating the penalty as 2.5% of your total household income. You won’t be required to pay an amount higher than the national average yearly premium for a bronze-level plan. The second method computes the penalty as a $695 charge per each adult in the household, and a $347.50 charge per child. The maximum penalty due with this method of calculation is $2,085. Only employers with 50 or more full-time employees are required to provide health insurance. Employers of more than 200 individuals – “large employers” – are required to automatically enroll their employees in employer-provided healthcare, whether or not the employees are aware. However, with the drastically rising cost of health insurance under the Affordable Care Act, many employers will discontinue offering group coverage, and instead encourage their employees to purchase individual coverage. Large employers not providing each employee with health insurance will pay a penalty of $2,000 per employee per year, much less than the projected cost for health insurance per employee – so some larger groups may also discontinue offering group coverage. Who is Exempt from the Tax Penalty? The Individual Mandate does not apply to members of some specific groups. If you belong to a healthshare plan, you are legally exempt from the requirement. These plans do not offer all of the benefits of Obamacare plans, but they are a way of sharing medical expenses in a large group. You must be in reasonably good health to qualify, and most require that you agree to certain moral statements upon joining. But they are a legal way to exempt yourself from the requirements of Obamacare, and they may save you as much as 50% on your monthly health coverage costs. Grandfathered Plans: If you have had your coverage since October 23, 2010, or before, it is considered to be “grandfathered” and you are not required to purchase a new reform-compliant plan. As long as you maintain your grandfathered policy or obtain a new post-2014 reform-compliant plan, you will not have to pay the tax penalty. Religious Exemption: members of recognized religious organizations who have received conscientious objector status, such as the Old Order Amish or Old Order Mennonites, are not required to comply with the Affordable Care Act. To be approved for a religious exemption, you must go to your state’s “Health Insurance Marketplace” and apply for an exemption. Incarcerated or Unauthorized Residents: Unauthorized residents of the United States and the incarcerated population are not required to carry health insurance. Low Income Exemption: Individuals and families with an estimated 2014 income so low that the insurance premium would exceed 8% of their adjusted gross income are exempt, including those living under the poverty level ($11,490 for an individual, $23,550 for a family of four in 2013). American Indians: Many American Indian tribe members receive medical care through the federal Indian Health Service. Those who do, from both federally and state-recognized tribes, are exempt from the law and are not required to carry coverage. They already have a federally sponsored local health program, so they are exempt. However, many Native Americans who currently receive care from Indian clinics are not exempt, and will be required to purchase coverage or pay the tax penalty. Other Excluded Groups: Hardship exemption recipients, Children’s Health Insurance Plan (CHIP) participants, and Medicare enrollees are not required to participate. Veterans and recipients of Tri-Care healthcare are also not required to comply with the Affordable Care Act. Under the Affordable Care Act, everyone must report to the Internal Revenue Service their health insurance status. Each end-of-year income statement, W-2 or 1099 form includes notice of income and health insurance in compliance with the Affordable Care Act. The W-2 and 1099 forms also include the dollar value of the employer-provided health insurance. Individuals who purchase their own health insurance will receive a statement, a version of the 1099, from their insurance company to include with their tax return. The IRS will actually have very little ability to enforce the mandate. They can withhold tax penalties from income tax refunds, but they are not allowed to use aggressive strategies such as seizing property. The IRS is permitted to carry over the tax penalty on one’s tax records from year to year and, in addition, to charge an interest rate, currently about 3%, on unpaid tax penalties. However, if you are never in the position of getting a tax refund, they may have a difficult time collecting. If you don’t fit into any of the above categories, you still might qualify for a hardship exemption. If you are experiencing or have experienced any of the following, you could qualify: domestic abuse, received a utility shut-off notice, foreclosure or eviction, cancellation of health coverage, fire, flood, etc. You’ll need to provide supporting documentation and then complete and send in the hardship exemption form. Health Care Reform is intended to be a good thing - to get more people covered by health insurance. Sometimes, though, even good things like health care for more people brings with it challenges and questions. 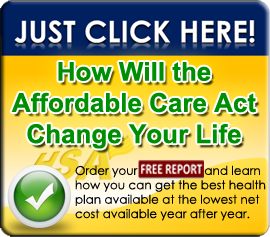 HSA for America can help with the questions and challenges that come with the Affordable Care Act. Our Personal Benefits Managers are a team of qualified and experienced health insurance agents, with more than 25 years of experience, ready to help you make the best choices for your family's health care needs. Contact us today for a free quote or for an answer to your questions. Our services come with no obligation and are free to you. We also have a Health Care Reform blog where we discuss other issues surrounding Health Care Reform.